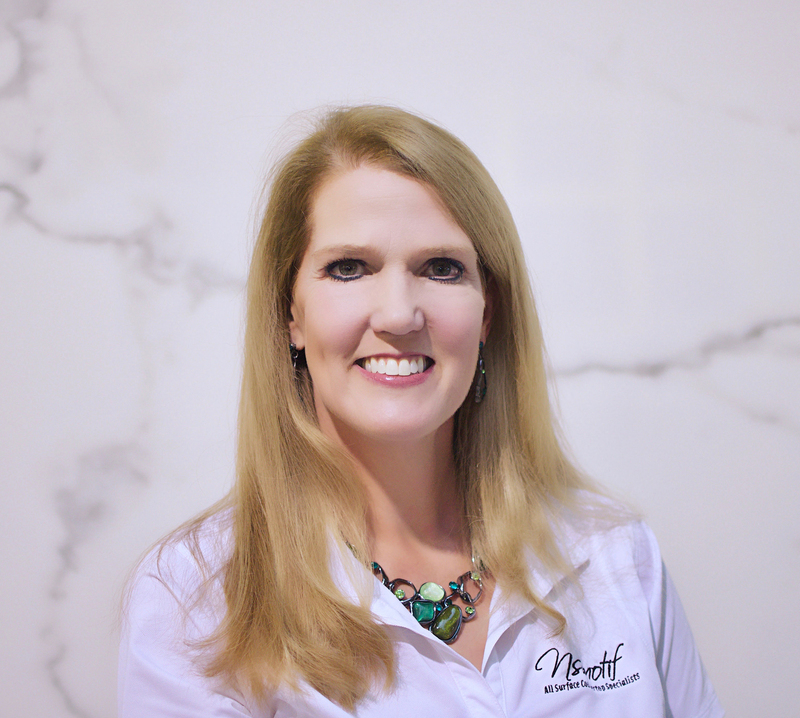 NSMotif is a female-owned, family-operated full-service fabricator based in Sanford, Fla., that takes full advantage of every opportunity to improve upon its successes and set itself apart from its competition. However, setting itself apart doesn’t mean the company separates itself from its peers. In fact, Founder and President Karen Roe credits the company’s involvement in the industry as a major factor in its success. Originally established in Altamonte Springs, Fla., as the company grew, now with almost 40 employees, so did its operations. By 2015, the company had outgrown its original home and that was when the move was made to its current location. By working with so many materials, the company has a great opportunity to be creative and, more importantly, bring to life anything their clients can come up with. From vertical applications to customized edge profiles, the team gets to show its true skills and create whatever a customer may desire in their favorite surface. This versatility leads to diversity in the markets that the company is able to serve. Refining processes, learning new techniques and technologies and improving both fabrication and business skillsets requires knowledge sharing, and as such Roe and her team are heavily involved in various trade/business organizations. This allows for continuous improvements and sharing of best practices. NSMotif are members of ISFA, NKBA, MIA+BSI and is a charter member of Rockheads Group, an invitation only professional organization that has around 70 members and focuses on sharing best practices. The company is only the second company to be MIA accredited in the state of Florida, a fact that Roe takes pride in and referred to a valuable yet “grueling process for a fabricator to go through, covering all aspects of their business.” And with running a female-owned business in an industry largely dominated by men, Roe also takes pride in empowering other woman and is particularly dedicated to the MIA’s Women in Stone segment of the organization. As such, Roe is speaking at the Fabricator’s Forum at The International Surface Event (TISE) on January 30, 2018, and in China for the MIA in March of 2018. The company also recognizes the investing in its employees training and their safety, as a means to keep them up to speed on methods, engaged and injury free. Last year, NSMotif even was awarded the Sunshine State Safety Recognition Award for going above and beyond to follow and implement all OSHA laws and guidelines pertaining to their business. It is these investments in diversity of both materials and outlets to market, advanced equipment networking, training and safety that have been the mainstays to the success of the business. Involvement alone does not insure success, but rather utilizing the contacts and applying the information gathered is key. One way the company does this is keeping an eye on trends, and Roe certainly knows what is favored among her customers. Because the company remains in touch with the developments, the staff is able to guide its clients down a path that fits their applications and their aesthetic needs. “We hold our customers’ hand through the entire process making sure they are educated well throughout each step, particularly in their choice of materials so that we can exceed their expectations each and every time,”said Roe. When asked what advice she might give to other fabricators seeking to improve upon their successes, Roe reiterated the importance of getting involved and continuous improvement, but also explained the importance of knowing your company’s unique selling proposition. She said it is of significant importance to also make sure it is a dynamic thing that is tested, measured and changed when necessary. Roe also said that every team member must be on the same page when it comes to the direction and goal of the company. “Truly think about and create your core values and the focus for your company and build and grow on those,” Roe said. She stressed that every team member must be on the same page when it comes to the direction and goal of the company. Roe credits her excellent team for their support and involvement in helping NSMotif get to where it is today. “Our team is unified and knows the core values and vision of our company,” she said. “We strive to keep our customers’ satisfaction and expectations first and foremost. Also, put some thought behind your marketing initiatives and your branding. People won’t recognize or remember you if you’re not actively making your business visible. Create the experience for the customer, don’t be just another fabricator. “We’re about to celebrate our 10th anniversary and I couldn’t be prouder of how far we’ve come in the last decade,” Roe added. And there’s little doubt that that pride is well deserved. For more information, contact NSMotif, 1050 Central Park Dr., Sanford, FL 32771, (407) 774-0676, [email protected], www.nsmotif.com.